Balance Your Day with Equal Parts: Cycling, Fitness and Adventure! Excitement & exercise: the perfect day! First, You're in the Okanagan. That's a Great Start right there. Now let's make it perfect. Whether it's a mellow Zen Tour, the Adrenaline Addiction of our Adventure Packages or a pulse pumping Bike n' Boot Camp, we've got all the ingredients for Perfection in Paradise! First, we join certified yoga instructor Nikki Jinks at Waterfront Park in Kelowna for a gentle Vinyasa routine designed especially for cyclists. Then, we set out on bikes for a spectacular 3 hour exploration of some of Kelowna's most scenic areas. Along the way, we'll make a few stops to introduce you to our favourite local gems - the hidden treasures that many visitors never get a chance to discover: a quick coffee stop at Gio Bean, an amazing Urban herb garden, a peaceful Japanese garden in the heart of Kelowna, a lavender farm and Kelowna's hidden falls - Crawford Falls. We start with a ride through the vineyards, orchards and spectacular scenery of Lake Country. Starting in Winfield, we'll loop through the quiet backroads and eventually descend to the south shore of Woods Lake. Then, we climb back up on the west side of the Lake and follow Oyama Road to Oyama Zipline Adventure Park. There you'll go on a 2.5 hour zip tour over 7 different zip lines, with speeds reaching 85 kph! After that, it's time for lunch at Gatzke's Orchard and Farm Market, then a gentle ride back to Winfield along Wood Lake. After loading the bikes up and grabbing a coffee for the road, we take the G.O. Shuttle to the Myra parking lot. We ride over 18 trestles and through one tunnel, to the Little White Service Road (where we have a snack break). 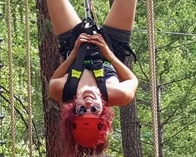 Then, it's a short down hill ride to the Myra Canyon Adventure Park, where you can explore through 20 acres of adventure: including rope courses, bridges, swings and more. There are 74 different climbing elements in all! Then, we wrap up with an optional lunch at the Myra Canyon Lodge and head back into Kelowna on the G.O. Shuttle. After loading the bikes up and grabbing a coffee for the road, we take the G.O. Shuttle to the Myra parking lot. There, you'll first ride through the 18 trestles of Myra Canyon, then continue to Chute Lake Lodge where we'll meet you with a catered picnic lunch (and - if available - a slice of Doreen's famous apple pie). Then, you'll continue down to the Naramata Bench (with a spectacular photo stop at the Little Tunnel) on the Kettle Valley Trail, where we'll meet you for a wine and cheese tasting at Poplar Grove Cheese and Lock and Worth Winery. Then, ride through the vineyards and orchards surrounding Munson Mountain to the pick up point at the Bench Restaurant and Market for the shuttle ride back to Kelowna.